You need to be a member of VATSIM to connect to VATSIM. Membership is free; visit http://vatsim.net to learn more and sign up. FlightGear (any version). You can run FG on any platform: Windows, Mac, Linux, etc. SquawkGear. This is the python script I have written. SquawkBox 747. Download this from http://hoppie.nl/sb747. SB747 is the VATSIM client for the Aerowinx 747-400 sim (popularly called “PS1”), but because of its design and interface, it is possible to link it up to FlightGear. Download the PDF manual as well. Advanced Voice Client. 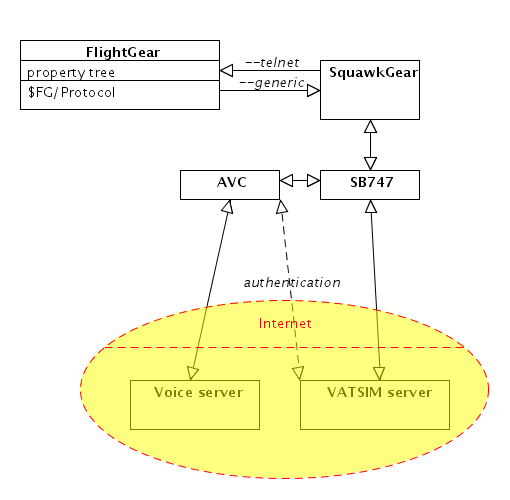 AVC is the voice client for VATSIM. It works independently from SB747 and it only handles voice communications. You will need a Windows computer to run SB747 and AVC, because these two programs are not cross-platform. You may be able to run them inside an emulator (like WINE) or virtual machine (like VirtualBox, VMware, QEMU, etc) but this is untested. Make sure that you have a microphone plugged into the computer that AVC runs on. Many VATSIM pilots use a headset with boom microphone to free up their hands for flying. It is possible to run FlightGear, SquawkGear, SB747 and AVC all on the same Windows computer. You might however experience lower framerates in FG due to the increased CPU load. If your sound hardware doesn’t support multiplexing, you may not be able to hear FG sounds simultaneously with voice communications from AVC. YMMV. You will need internet access. Broadband is preferred for voice comms (using AVC); dial-up is suitable for text-only communications (SB747 alone). If you run the programs (FG/SqG/SB747/AVC) distributed across multiple computers, you will need to connect them over a LAN. Is this still up to date? I dont see a date on this article, but is this still the most updated way to accomplish putting FlightGear and Vatsim together? Yep it’s up to date, nothing has changed since May 2010. Is it still up to date 6 years later ? The file links are all broken. Where can I find them?